The Old Wives’ Tale by Arnold Bennett is a surprisingly dark novel about the anguish and suffering inherent to human life. We live, we love, we suffer, we die. And ultimately, whatever success we manage to achieve is transient, not leaving much more than the shadow of a smudge on the world: it took not even two generations for Mr. Baines’ fabric store to be walled off from his attached home and sold after his death, and a large sign – with his name on it, no less – (something he railed against during his lifetime, considering such ostentatious self-promotion gauche) to be hung out front. But as the title suggests –taken literally as the tale of two old women, rather than as a piece of unsubstantiated medical superstition – is the story of the Baines women. More specifically, this is the story of how the particular hardships and disappointments of two sisters, Constance and Sophia Baines, influence their innate character. The Baines are an upper-middle class family of drapers in a provincial England town at the beginning of the 20th century. Mrs. Baines laments “deeply on the martyrdom of her life” for although she’s always “endeavoured to be kind, just, patient [and] knew herself to be sagacious and prudent,” fate saddled her with an invalid husband and one willful daughter who elopes to Paris with a scoundrel salesman, and one steady daughter who marries wisely, but beneath her. What Mrs. Baines comes to realize in the twilight of her life, and what Bennett illustrates through the lives of Sophia and Constance, is that while fortunes may be made (and inherited) disappointment and suffering are unavoidable aspects of the world. In Arnold Bennett’s world, frustrated desires are the order the day. The headstrong and beautiful Sophia longs to see the world outside of Bursley and can’t imagine a life more horrible than following in her mother’s shoes as the matron of the family shop. She wants a career of her own (her mother is scandalized when, for a brief time, Sophia insists she be allowed to train as a teacher), a career that will preferably take her to London. When the widely-travelled Gerald Scales comes to town on business, Sophia can’t see him for the spoiled creep that he is. To her, Gerald is a cultured sophisticate, the perfect man to teach her the ways – to show her –the world. As it turns out, Gerald is also an unconscionable seducer, and after a secret correspondence, he convinces Sophia to run away with him to Paris. Not completely lost to passion, Sophia insists they marry in London. For better or worse, the couple live the hotel -life of restaurants and parties in Paris. That is, until Gerald’s money runs out and Sophia refuses, by this time aware that her husband’s a scoundrel, to hit up her family for money (whom she’s been ashamed to contact all these years), and Gerald leaves her. For Sophia, this is more of a blessing than a curse, and circumstances find her the proprietress of a boarding house that soon, thanks to her strong character and business sense, prospers. Constance, on the other hand, lives a life not much different from her mother’s. She marries a reliable, if unadventurous, man: her father’s former assistant, Samuel Povey. Their young love dims to companionship that, while not passionate, is amiable and satisfying. Anyway, both are far too devoted to their only child, Cyril, for romance.When a grown Cyril moves to London to pursue his artistic education, poor Constance is more devastated than she was by her husband’s death, and having already sold the store, she’s left alone in Bursley with nothing to do but fret about her rheumatism and the insolence of her servants. Although Sophia and Constance live lives as different as their characters, as they’re reunited in middle-age, Bennett shows us how, while materially comfortable, both have led lives unfulfilled. That both Constance(through inheritance) and Sophia (through resourcefulness) are wealthy is key to understanding something particularly striking about this book: Bennett seems to be suggesting that at its source, the inherent disappointment of the human condition is social. That is, no one suffer from unrealized personal ambitions. Mrs. Baines is plagued by her daughters’ disobedience and the loneliness of life married to an invalid. Daniel Povey, the most popular man in town, is shamed by an alcoholic wife who sends him, literally, to the gallows. Sophia’s disappointment comes from the realization that she’s married a scoundrel who deprives her of a family. Constance’s particular regret is that the one love in her life – her son, Cyril—treats her with a casualness and disregard that can only be called cruel. The manner of his life was of no importance. What affected her was that he had once been young, and that he had grown old, and was now dead. That was all. Youth and vigour had come to that. Youth and vigour always came to that. Everything came to that. . .The riddle of life was killing her, and she seemed to drown in a sea of inexpressible sorrow. Much has been written about Bennett’s detailed realism –famously maligned by Virginia Woolf—but I’d argue that there is a delicious irony in Bennett’s inordinate preoccupation with physical details: Bennett makes as much of a wall, or a window, or a door as we make of inconsequential particulars in our own lives, and the impatience we feel at reading all this description – when used in service of such bleak themes as the disappointment inherent to human existence –brilliantly reminds us of the unimportance of the mundane details we seem to let overrun our own lives. I really loved this book when I read it. It was one of the more surprising ML books for me because I had no knowledge of the author or what to expect. It had a way of putting everything in perspective. That's one of the great things about reading through the list: discovering books you didn't even know existed, especially when you end up liking them. The description in this book is beautifully precise. I never grew impatient reading it. 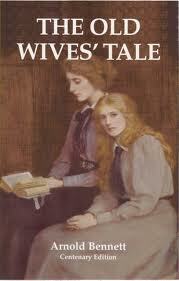 "Old Wives Tale" is written in High Definition. A moving and involving tale. Devon S. is a Canadian writer, who lives in Paris, France New York City. Here is where, she'll share her thoughts on reading through the Modern Library List.